Thu., March 30, 2017, 5 a.m. The Spokane region’s 2017 road construction map was unveiled on Wednesday to help motorists navigate around this year’s work zones. The interactive map can be viewed online through different platforms, including mobile, said Staci Lehman, senior transportation manager. For a number of years, local agencies and the state transportation department have cooperated in creating the map. 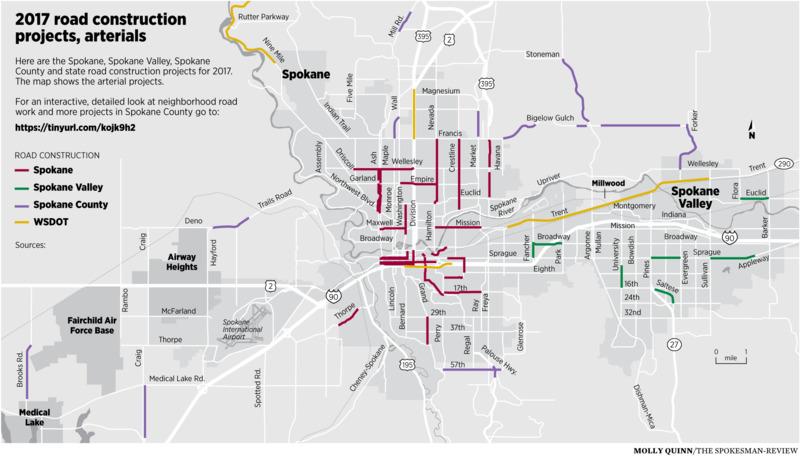 The map can be found off the main website for the Spokane Regional Transportation Council, which coordinated the map. The website is at srtc.org/. The map will receive updates weekly as new information becomes known or projects are completed. Another repaving job is planned for state Highway 290 (Trent Avenue) from the Mission Avenue “Y” to Sullivan Road. I-90 will also get new pavement from the Spokane County to Adams County lines. Two new North Spokane Corridor bridges are now under construction over Freya Street. Martin Luther King Jr. Way construction is continuing. Work continues on 37th Avenue at Freya Street. Also, expansion joint and concrete panel repairs are planned for Interstate 90 from Monroe to Perry streets. State Highway 904 through Cheney is getting new pavement as well. The city of Spokane is in the middle of a stepped-up effort to install wastewater retention tanks to stem the release of untreated sewage into the river during storms. The city also has major work to upgrade Sprague Avenue from Helena to Stone streets in the first phase of a two-year project. Installation of aesthetic upgrades, landscaping, curb bump-outs and pedestrian lighting will continue this year on Division from Third Avenue to Spokane Falls Boulevard. The first phase of improvements to the Centennial Trail crossing at Mission Avenue and the Spokane River are planned. Seventeenth Avenue from Perry to Fiske streets will get new pavement. Spokane County is planning major projects on Bigelow Gulch Road and Argonne Road. The county is also planning to rebuild Market Street from Houston Avenue to Lincoln Road. Monroe Street from Francis to Greta avenues is being resurfaced. In Spokane Valley, work will resume on the new Appleway Trail. Indiana Avenue west of Evergreen Road is also slated for repaving and other improvements. Pines Road north of I-90 is getting additional turn lanes, widening and drainage. Final work on a new Sullivan Road Bridge is also planned early this season. “Each year, SRTC partners with jurisdictions in Spokane County to put all construction projects that impact traffic on one map. This countywide map helps prevent delays caused by road construction,” according to a news release from the agency on Wednesday. Published: March 30, 2017, 5 a.m.